Brookville- Brookville Glove Manufacturing has gone through some exciting changes recently. The newest change being their new department Embroidery & Printing by Brookville Glove. Embroidery & Printing by Brookville Glove has access to thousands of different products like hats, polo shirts, dress shirts, t-shirts, hoodies, jackets, bags, etc. All of these items will be available in your favorite brands like Gildan, Hanes, Columbia, Adidas Golf, Champion, Carhartt, and MORE! Embroidery & Printing has a state of the art embroidery machine that will give customers the best quality. Embroidery & Printing will strive to have some of quickest turn around times. AND don’t you worry about logos and designs…they will all turn out perfect thanks to Brookville Glove’s new sales representative/ design coordinator, Alyssa Knapp. Alyssa is a Brookville native and brings so many talents to the table. She started her own photography business in 2013. Alyssa understands what customers want and makes their visions come to life. With the new Embroidery & Printing business at Brookville Glove, Alyssa is the perfect sales person. She has an extensive background in various different design software’s and can make your logos and designs on clothing absolutely perfect for you and your business. Brookville Glove is a skilled manufacturer with 131 years of service and also an experienced distributor within the industry. 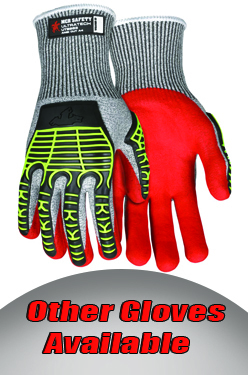 We provide superior hand protection for both on and off the job. For many generations our products have been the choice for a variety of people, such as ironworkers, welders, glass plant employees, construction companies, farmers, oil/gas drilling labors, and lumber handling use. Our technical services include glove to job compatibility analysis and custom manufacturing. In addition, we offer you the choice to get your gloves hooked and tagged for your retail business. Custom printing with your company logo on any pair of gloves is also available.